Firstly it was reported Nicole Richie was living in Joel Madden's Glendale home and then just a few months ago it was reported the RichieMadden's had bought a spanish style home in the Outpost estate and now it is rumoured they are living in Laurel Canyon. 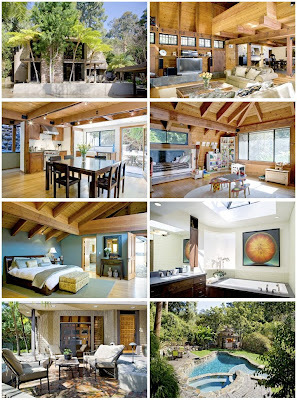 These are apparently the picture's of the inside of their new home .. LOCATION: Lookout Mountain Road, Los Angeles, CA. SIZE: 5,380 square feet, 4 bedrooms 5.5 bathrooms. DESCRIPTION: Privately hidden behind gates, this walled compound is one of Laurel Canyon's largest! Extensively renovated with contemporary design focus, the ambiance is Aspen Lodge meets Tropical Paradise. Soaring ceilings with huge sky dome adds dramatic sunlight. Full guesthouse becomes screening theatre. Lagoon pool features Key West cantina. Motor court & garage parking. I'm not sure how many homes they have in Los Angeles or if they have just the one but as Joel Madden would say 'Lifestyles of the rich and famous!' - Its a good life and this looks like a fabulous new home for the RichieMadden family and their new edition. I know for sure they have the one house in Glendale, they live 3 blocks from me :), Im sad they are moving now,haha. But that house is so gorgeous!